One of the things that you might not know about some of the world’s greatest technology is that it was conceived and developed right in the heart of Silicon Valley in a place called SRI International (formerly known as the Stanford Research Institute). This, my friends, is the birthplace of the Internet, the computer mouse, electronic banking, and perhaps the most recent and famous success, Siri. Today, Norman Winarsky, SRI’s vice president, sat down with members of the media to share insights about what’s happening with the company, how it views investments, and much more. There was a lot for him to share too, especially about an organization that was founded in 1946 by Stanford University to discover and research the application of science and technology. In 1970, it parted ways from the university, but still is pursuing the same mission since its beginnings. But before we get into that, some quick facts: did you know that this non-profit organization has produced more than 50 startups in its history, many of which have resulted in success? Four companies have gone on to IPO (total market capitalization exceeds $29 billion), 20-30 have been acquired, and 10 have been shuttered. Because of this, SRI has done exceptionally well and has amassed over $500 million in revenue in 2011 to support its innovation. Where exactly is all this revenue coming from? Winarsky says that 70-80% comes from the US federal government, but through the Bayh-Dole Act, SRI managed to keep the commercial rights to its products, while the US got governmental rights over it. Winarsky says that some of SRI’s additional revenue comes through licensing of its products. These don’t necessarily need to come from companies that the organization created. In fact, if there’s not a disruptive enough solution to warrant creating a company, he says that SRI will probably just distribute the technology via a license. It also has an royalty-equity program that shares 34% of the amount received to the owners. But while SRI is known for its accomplishments, it still has to fight to get funding from the US government, and that means dealing with the political bureaucracy and other economic factors such as what’s facing the country today: the fiscal cliff. In the event of a worst-case scenario where budgets are slashed and funding dries up, Winarsky tels us that SRI has contingency plans thanks to its healthy war chest. From its equity and royalty programs from its for-profit entities, it can receive that income and use it to fund the organization without paying taxes as long as it’s being used to benefit the non-profit. One of the central themes of SRI when it creates a new venture is that it needs to help with the health and prosperity of mankind. It’s not in the business of helping to educate. Winarsky says that innovation will come from the organization when it discovers a vulnerable large market that is open to a major market disruption, something that he says is a rare event — in the last 15 years, while they average about three per year, the ones that have gone public are: Intuitive Surgical, Nuance Communications, and Orchid Cellmark. He was asked about augmented reality and why SRI hadn’t funded or created a venture around it when companies like Google are investing in it with their new products. Winarsky replied that SRI had been exploring it but hasn’t found a solution for the space that is more than just training, game play, or the other kind of things that we’ve been seeing. At this time, a deep market pain hasn’t shown itself and until it does, SRI will most likely observe, but not advance. 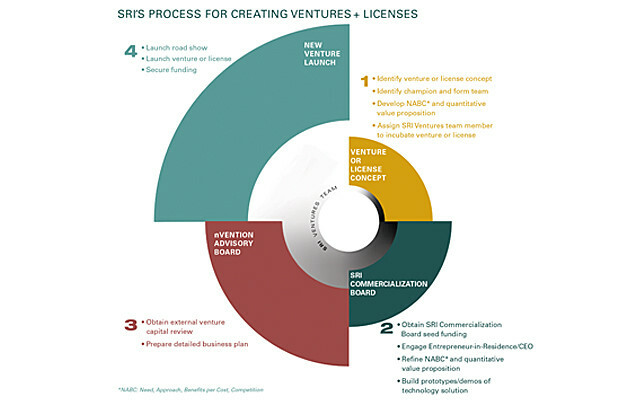 SRI has created many unique and society-changing tools and technologies in its history, all of which fit within its mission of finding that market pain point and fixing it. Often, with these types of innovations, the funding isn’t necessarily available from people like seed and angel investors as the process to get it to market and potentially commercialized can take years — a service like Siri could take 20 years, for example. For Winarsky, he cares about the “last mile of commercialization”, something he believes investors in general aren’t interested in — they’re more about the short-term, namely something that is a year or two away. He said that when things are invented, they’re usually at least 3-5 years away from being placed into market and typically companies won’t get an investment for something that far out unless it’s from a dedicated research lab within a company. This is why the federal government has placed an essential role in maintaining the research and development programs at SRI. With the major dynamic in the venture world being all abuzz over the existence of seed and angel funding, investments went to companies that would have a minimal viable product that would help to deploy a solution in the market. Winarsky says that venture capital has ceded the marketplace to early money and this is a serious problem for SRI because if it was constrained to just one or two funds, they would never have gotten the product out — Siri alone took $8.5 million to get the first round of funding, something uncommon in early stage funding these days. Can investors change in the short-term? Maybe. Right now, Winarsky says that the venture capital market won’t be corrected in the short-term in order to support major innovators, but there is a chance for it to happen in the long-term. He believes that the venture community will thrive and continue to help fund the true world-changing forms of technology. So what’s next for SRI? The non-profit organization has been focusing deeper on robotics while also exploring the education industry. 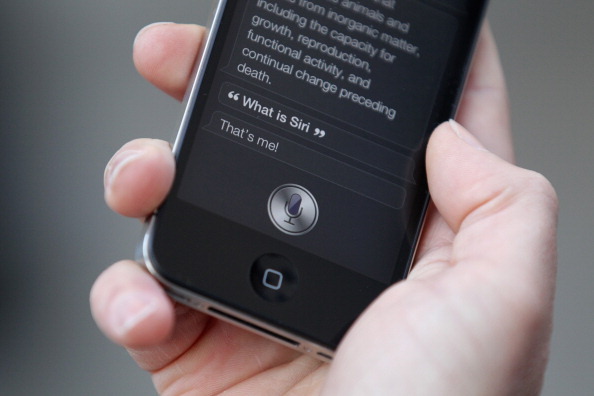 It has also expanded its research relating to the use of virtual personal assistants by releasing a travel vertical version of Siri called Desti and will continue to innovate on that front.